← Summer Slammin – Sorta! If you’re talking Bar Fishing then you’re talking Chinook salmon fishing. Chinook (AKA Spring, King or Tyee) salmon are the biggest of the five pacific salmon and these fish can get huge. 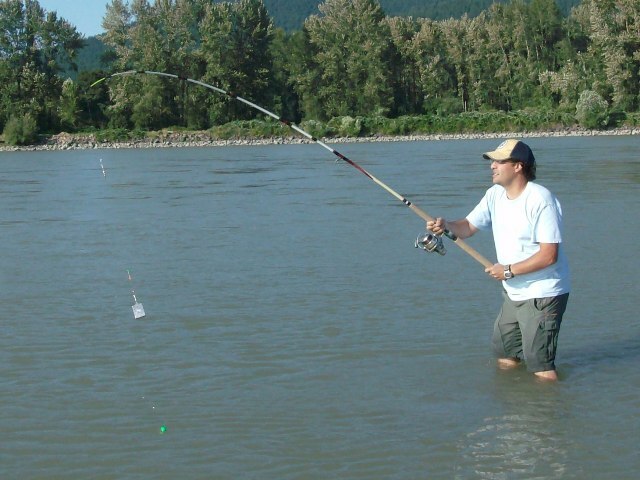 They are the first salmon to enter the Fraser River and its tributaries and it’s therefore not uncommon to see people out fishing for them as early as May, or as early as they are legally open to fish. Chinooks put up one hell of a fight, especially in the current of the mighty Fraser river, and are one of the most exciting species that we have ever fished. 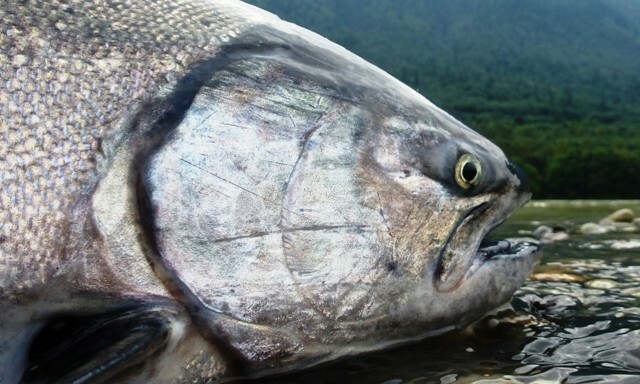 Unlike Sockeye salmon, Chinooks will feed and strike at lures during their freshwater trek to spawn therefore enabling the use of selective fishing methods. Bar fishing is one o those selective methods, tried and proven, and the focus of this post. Bar Fishing Rods: A good sturdy rod in the 10-12 foot length range will suffice. The rod should have a 20–30 lb line rating and be able to cast 10-24 oz weights with no problems. 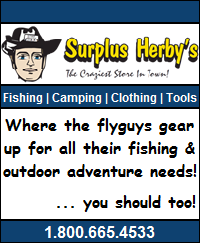 There are, of course, many different brands and models to choose from including spinning, mooching, and casting rods, from companies such as Trophy, Shimano, Ugly Stick, Diawa, Quantum, and many more. Prices range from $50 – $250 and of course include a wide range of quality. It’s all about personal preference and cost so try a few out and then buy the one that feels best for you within the price range that you’re willing to spend. Bar Fishing Reels: Bar Fishing requires a big strong reel that will allow you to throw heavy weights with ease. It needs to be able to hold a large amount of line (200–300 yards) and needs a gear ratio between 4.0 & 5.0 to handle the big weight – including that of the fish that you are hopefully going to be fighting! 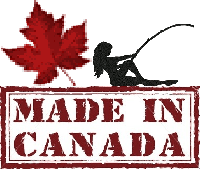 Companies that make good Bar Fishing reels are Penn, Abu, Shimano, Quantum, Okuma and many others. All of these reels are a bit different so, like the rod, you are going to have to try a few and see what you like and then buy the one you like the best within your price range. If you can afford it, we highly recommend the Abu Garcia 7000 – it’s probably the most versatile level wind reel out there and it’s simple to fix (tune up) and parts are cheap! Main Line: We use and recommend using 50- 100 lb braided line. Spider Wire, Power Pro, Tuf line … no matter … any brand braid should do just fine as long as it’s heavy enough to hold onto those tanks! Spreader Bars: These come in many different sizes. Anything between 6 and 10 inches will work just fine. 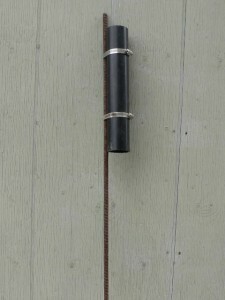 Tie on about 6 inches of 40-50lb test line to the bottom of the spreader bar and attach a clip to the end. This is where your weight will be connected. Leader Line: It’s a good idea to use very thick and not so flexible line for leaders to allow the spin n’ glows to spin well. Limp line flexes in the water and impedes the spinning of the lure. Also, Chinooks have very sharp teeth and thin line will be easily sliced or frayed. Maxima at around 60 lb test seems to work well but there are a lot of options so look around for what works for you. The average leader length is normally 1-4 feet long depending on the depth and type of water being fished. Spin n’ Glows: Like everything else there are many different types, shapes, sizes and colors of spin n’ glows. They also come with different styles of wings – mainly Mylar and rubber. The options are endless but we suggest starting off with a few red top chrome bodies, a few green top chrome bodies, a few yellow top chrome bodies, and a few orange top chrome bodies; all in sizes single O and double OO and with Mylar wings. Other good colors are yellow body with red or orange spots, metallic blue, green with black stripes, and red or orange top with a green body. All of these will produce fish but some will work better than others at any given time so play with them and see which works best for you – you will soon develop your own favourites. *A tip when choosing which spin n’ glow to go with is to use bigger sizes and darker colours when water visibility is poor. In dirty water choose the OO since they make a lot of noise and vibration while spinning. Another low visibility trick is to poke a few holes in the spin n’ glows wings and/or drill the center of the spin n’ glow on a lopsided angle – these allow the spin n’ glow to generate a lot more vibration and noise and will therefore help to get the Chinooks attention in low visibility water. During light water conditions use a light colour spin n’ glow. Beads: Beads are used to prevent the spin n’ glow’s burning through the knot attaching the leader to the hook and can also serve as attractors. 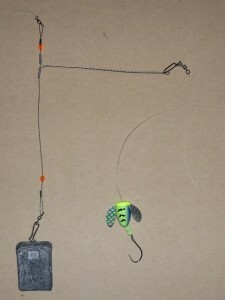 Place a couple of them on right before tying on the hook so the spin and glow will sit and spin against them. Hooks: Fairly big hooks are required for Spring salmon fishing. Gamakatsu Octopus style in sizes 5/0-8/0 are recommended. Remember, if they are barbed pinch them off or simply purchase them barbless to begin with. Weights: Weight size will depend on the speed and bottom structure of the water you have chosen to fish. You need a weight size that will just hold the setup from moving away with the current … too small and it will not hold … too big and you will hang up and cause you troubles fighting a fish. On the Fraser River’s fast moving water 18–22 oz of weight may be required to hold your gear put. On the other hand, slower water, or water with big structure to help hold the weight in place, may only require 12–16 oz of weight. You will need to experiment until you find the right weight for the job at the time. Bells: OK once again there are many types and brands of bells on the market. You got your big bells, your little bells, your bell shaped bells and your not so bell shape bells. Suffice to say, it doesn’t really matter. 😕 Just get one that makes enough noise for you to hear it when the rod starts moving and with a sturdy enough clip that it won’t blow off the rod in a strong wind! Clip the bell to a toppish eye on the rod and tie on a 6 inch or so piece of bright flagging tape so you’ll be able to find the bell after you rip it off and toss it aside to fight a fish – if you’re lucky! 😉 Oh and it’s a good idea to carry some spares cause even with the flagging tape good luck even remembering which way it went during the excitement of setting the hook! So in summary, the terminal set up consist of a spreader bar off the mainline with weight off the bottom of the bar and a leader of 1–4 feet off the mid section with a spin n’ glow sitting on 2–3 beads just before a potentially scented and/or baited hook. OK you got the gear and you’re all rigged up … now what do you do with it all? Well the good news is that setting everything up is really the hardest part of Bar Fishing chinook salmon. The only thing left to do before sitting your self down and relaxing while waiting for the little bell to alert you of a potential fish on is to get everything out into the water. Start by reeling everything up to the rod tip – right up to the spreader bar. Now flex everything back and load the rod and then lob it all forward, out and a bit upstream into the water. When everything hits the water there should be a little downstream movement until the weight hangs up and then everything should come to a stop. If you don’t get a stop, or it travels too far downstream (and therefore too close to shore) before stopping, then you may need a bigger weight (see weights above) so reel it all in, add some lead and try it all again. Bar Fishing Chinook Salmon – The Cast! To maximize your chances of success you should be Bar Fishing Chinook salmon when they are working their way up river in substantial numbers. 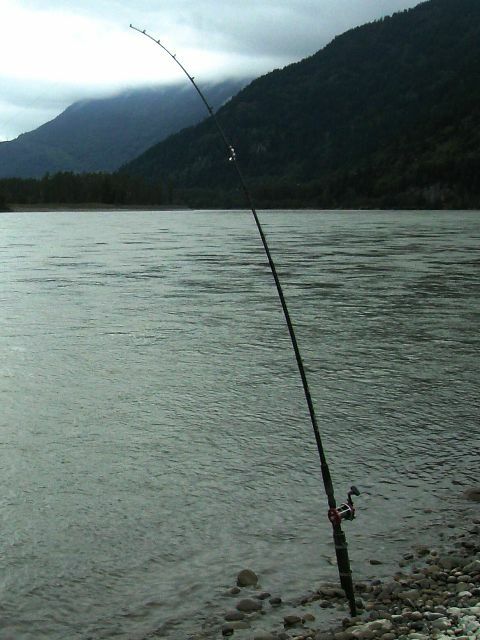 In the Fraser River, mid June to mid September typically produce great numbers of both red and white Spring salmon. Late September to late October also produces high numbers but with a higher proportion of whites than reds. Look for a bar that gradually slopes or is a channel or hole where fish will travel or hold. The water should be about 5–8 feet deep and moving not too fast nor too slow. A fast brisk walking speed is excellent Bar Fishing water as it allows the lure spin just right! Any faster and the spin is on overdrive and any slower risks it barely spinning at all. From June to mid September anywhere in the Fraser can be good. From mid September to late October there are still good numbers of Spring in the river but they tend to be focused below the Harrison River. During this time of year the Fraser River above the Harrison is very much hit and miss. Well that’s it folks! Gear up, check out the fishery numbers, get out there and give it a try! The worst that can happen is you get to spend some quality relaxation time taking in the gorgeous scenery of the Fraser River and its surrounding areas! 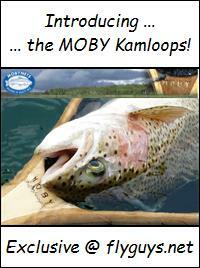 And who knows, you just might just get lucky and latch into one of those monster Chinook salmon and be hooked for life! This entry was posted in River Run Salmon Fishing and tagged Bar Fishing, Chinook Salmon, Fraser River Bar Fishing, King Salmon, River Fishing, Salmon Fishing, Spring Salmon. Bookmark the permalink. My dad took me camping at the Fraser River near Mt. Robson when I was really young. In short, I fell in love and it is one of my favourite places to visit and have long romanticized about pulling salmon from it’s waters. I am 99% a Walleye Fisherman (being from Alberta). I am wondering if you have any advice for fishing salmon near Mt. Robson on the Fraser. I am hoping to get out there on August long weekend and maybe again in the 2nd/3rd week of August. I worked as a guide up at Lake Athabasca and fished big lake trout. Using primarily large spoons and a modified flasher + hooch. I figured I could maybe try the flasher + hooch rig with a 2 oz. weight. I’m not really familiar with spreader bars… the photo of the rig (spin n’ glow + weight), is there a spreader bar in that rig? Anyways, ANY advice you have would be greatly appreciated.